The Alpha Pro MB charge regulator maximizes the output of Mastervolt Alpha alternators or any other alternator by regulating the alternator in a way that the batteries receive the optimum charge. The proven 3-step+ charge method used by all Mastervolt battery chargers guarantees fast and safe charging of your batteries. The charge regulator is designed as a fit all solution just one unit is needed for both 12 and 24 V applications with a simple selector switch to set the regulator to the right voltage. The unit can also be used on any other brand of alternator that has a standard Bosch connector with a cable supplied as standard in the box. Easy operation LEDs on the body of the regulator indicate the charge phase. The Alpha Pro MB is also fully connectable to the MasterBus CANBus system allowing easy monitoring via a MasterView touch screen. In a MasterBus system the voltage drop over the battery cable will be compensated automatically as well battery temperature improving the charging time without having to install additional cabling. The Alpha Pro MB helps to cut emissions by requiring less run time because it maximises the power from any alternator; a battery can be charged quickly even at very low RPM especially when connected to an Alpha series alternator. 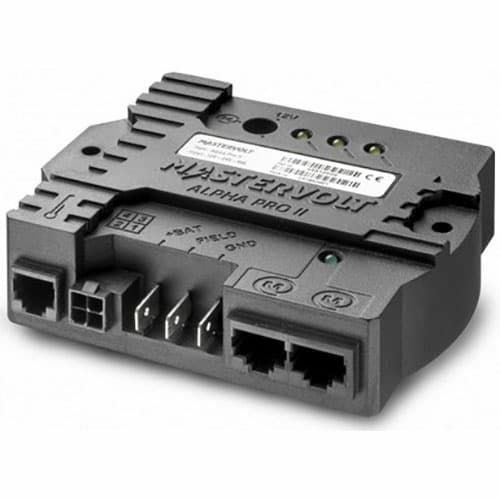 By connecting the Alpha alternator to a Battery Mate or battery isolator several battery banks can be charged simultaneously.